The boys love this sweet a lot. I don’t make them very often for some reasons. This recipe is probably the best one you will find online. It’s simply soft, moist and floppy almost like a cinnabon. It’s a lot of work but all the labor you will put into it is all worth it. I am lazy so I prepared my dough using a bread machine (dough cycle). The dough is going to be gooey and sticky once you take it out from the bread machine basket so always sprinkle it with some flour. DO NOT put too much flour, just enough to handle the dough. If you’re using a bread machine, please follow the manual instructions. I like to proof my yeast for some reasons. 1. PROOF yeast - in a small bowl warm milk in the microwave for one minute. 2. Add sugar, then yeast. 3. Cover the bowl with clean cloth. Set aside for about 10 minutes. 4. Pour the proofed yeast in the bread machine pan. 5. Add vanilla, softened butter, eggs, salt, white sugar and flour. 6. Turn the bread machine to dough cycle. (It will take around 1 hour to 30 minutes -according to my bread machine). 7. Once the dough has risen once, turn it out into a lightly floured surface. 8. Use the floured rolling pin to flatten the dough into a rectangular, approximately 12 inches wide by 20 inches long. 9. The dough might be sticky, so sprinkle some flour as necessary. 10. Brush the softened butter over the surface of the dough. 11. Mix the sugar and cinnamon powder. 12. Sprinkle cinnamon sugar over the butter, spreading the mixture evenly across the whole sheet of dough. 13. Start at the left-hand corner of the edge closest to you. Working from left to right, tug the lip of the dough up and over the filling, keeping it tight. Roll up the dough, tightening the log as you go. 14. cut the dough (pastry cutter, serrated knife or whatever you have) into serving pieces. 15. Place the cut rolls on a buttered or greased baking pan an inch apart. 16. Cover the rolls with a clean cloth and let them rise until they nearly double in size, about 30 minutes (I always place mine inside the oven with lights on). 17. When the rolls have double in size, bake them in pre-heated oven 375 degrees F.
18. Bake the rolls for about 15 minutes or more or until the top turn golden brown. 19. Mix powder sugar, lemon juice and milk. 10. 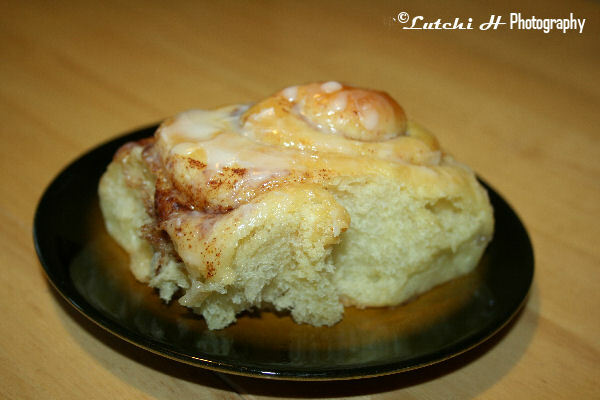 Immediately glaze or spread the mixture into the cinnamon rolls. 0 Comments On "Cinnamon Rolls"